Since 1998, in Division I Women’s Volleyball, 73.36% of first and second round NCAA Tournament hosts have advanced to the Sweet 16. In Baseball, the rate of success is 68.75% since 1999, when the tournament moved to its current format. It shouldn’t be of any surprise that host institutions advance through first and second match-ups, or regional play on the diamond a wide majority of the time during NCAA postseason competition. Hosts usually are – by selection criteria definition – some of the very best teams in the nation in a given season. However, even within a well resourced ‘Power 5’ league like the Southeastern Conference, the story of postseason hosting doesn’t start with wins or money, it starts with department alignment. In the hyper-competitive landscape of college athletics, where head coaches many times advocate for support increases that could mean a zero sum for a peer who shares the exact same facility, how can we achieve department alignment? More specifically, how can department alignment equal broad-based championship-level results? 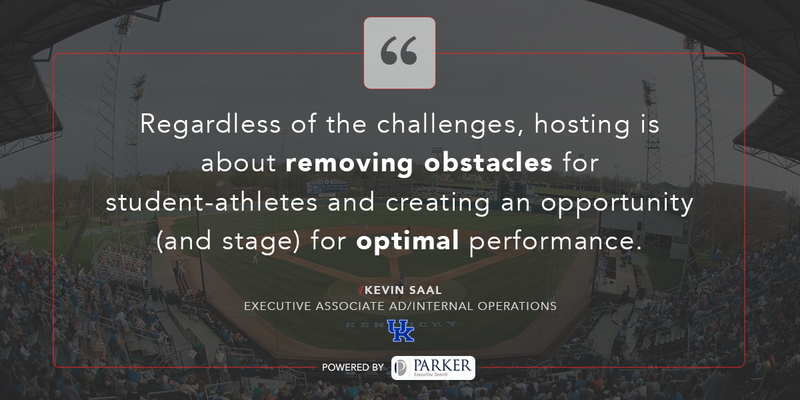 To answer these questions and build a framework for effective cohesion, let’s look through two lenses: 1) the positive impact of an athletic director setting the pace; and, 2) how removing obstacles for student-athletes and hosting postseason events can be a catalyst for positive department alignment. Back in 2008, University of Kentucky Athletic Director Mitch Barnhart pushed forward his bold 15 x 15 x 15 plan: 15 NCAA or conference championships and a Top 15 Learfield Directors’ Cup finish by 2015. To put it in context, UK had never won 15 championships in a seven-year period and the Wildcats’ highest previous finish in the Directors’ Cup was No. 26. In March of ‘15, we achieved those goals when Men’s Basketball won the SEC Tournament. During the seven-year stretch, Craig Skinner’s Volleyball program hosted the NCAA Tournament five times. The ability to host NCAA Volleyball action in Memorial Coliseum is a conversation that starts way back in the Fall of the previous year with Women’s Basketball, since the two share the Coliseum for games and practices. We sit down with each sport administrator and lead scheduler to lay out when the first and second round of the volleyball regionals for the following year to make sure we can schedule around those dates. Having the facilities is important, but what’s even more critical is having strong relationships among our coaching staffs (hence the complexity of organizational alignment). If we’re going to surpass the expectation that the NCAA has for us in the hosting role – which could include the possibility of a program giving up its locker room for three days – it requires exceptional cooperation among everyone in the department; while there are competing interests from a micro (team) standpoint, there is a clear understanding by everyone of the macro (department) benefits. Mitch’s new department initiative is 1-3-5 by 2022: Every one of our programs will win a conference or NCAA championship, we will maintain a department average GPA of 3.0 and finish in the Top 5 of the Learfield Directors’ Cup at least once (our highest finish ever is 11th). Of course, as the aforementioned data shows, we understand that achieving such a lofty goal will be made easier by the ability to host as many postseason events as possible. Thus, we must begin the planning process of doing so today, while making sure that each and every one of our staff members, coaches and student-athletes understand the sacrifice that will be necessary to accomplish a truly collective goal. Starting today, we’re hosting a baseball regional here in Lexington, our 2nd since 2006, with Indiana, North Carolina State and Ohio. We are extremely proud of the season our coaching staff (led by 2017 SEC Coach of the Year Nick Mingione) and student-athletes achieved. While we have one more season remaining in Cliff Hagan Stadium (UK is building a new $45M stadium set to open July 2018) and it may require some added sweat to get all the seats – literally – in place for this weekend, regardless of the challenges, hosting is about removing obstacles for student-athletes and creating the opportunity (and stage) for optimal performance. Because we now expect to host every postseason event we can, our team must constantly be working on the administrative and logistical processes necessary to win those bids. In our executive staff meetings, I typically share when bids are due and let our entire staff know what we’re getting ready to submit. That’s of critical importance, since we don’t want people wondering, ‘Are they going to submit or not?’ It’s made clear early and often that, we’re submitting, even if we’re not sure postseason is definitely in our future. That goes back to Mitch – we’re given the support, both financially and from a personnel standpoint, to aggressively go after championship events. Cliff Hagan’s capacity of 1,956 swells to 4,400 for regional play, which means we have to bring in a considerable amount of temporary bleachers. The problem of course is that temporary bleachers can’t be ordered overnight. That’s why nearly two and a half months ago, we reserved the temps with our partner in Chicago, in anticipation of hosting. Although Cliff Hagan opened in 1969, once the first pitch is thrown, it will look, feel and operate on par with some of the best ballparks around the nation hosting postseason play this season. In order to make that a reality, it takes people, really good people, with an eye on every small detail. Since my arrival in Lexington in 2007 (previous stops at Kansas State & UMKC), there were two of us. Our internal operations staff has since grown significantly. It’s all about the desire to do everything front facing in a first-class manner. And Mitch has provided the direction and resources for us to aggressively bid for and host SEC, NCAA and Kentucky High School Athletic Association championships. Over-communication is a major key for us. We want to be in touch with the head coach, sport administrator and athletic director of every program headed our way within 30 minutes of the selection show announcement. By communicating early and often, we’re able to make their visit more efficient once they arrive on-site. Head coaches hate to be inefficient, whether it’s during practice time or media engagement, especially during the postseason when nerves can be at their highest. We also assign an individual staff member to each coach/program – having the same, singular, knowledgeable, familiar face from the moment they arrive through the moment they leave can go a long way in creating a satisfying experience. While we obviously can’t control their performance outcomes, we can control everything else. While hosting NCAA postseason events is, in many ways, the byproduct of having highly-successful programs, it doesn’t mean the NCAA has to come back to our campus if we don’t put on well-communicated, well-executed, and enjoyable events for all teams and fans involved. This is made more important by the fact that a significant portion of the NCAA’s selection criteria is based on reviews of previous postseason hosting opportunities and feedback from visiting coaches and administrators. Mismanaged events tend to be a reflection of an area ripe for improvement within the organization responsible for creating the product. For example, if your organization is siloed and disconnected, the dysfunction of the organization as a whole, in some form or fashion, may translate into dysfunction in the venue, at the event or on the field/court. The next time you are hosting a championship event on campus, ask yourself: “What are you trying to communicate on a national stage?” How can you represent the best of your organization to visiting administrators, coaches, student-athletes, media, etc. Once you’ve identified your ideal state, chart a course towards achieving your objectives and be honest and constructively critical in your post-event evaluation. What didn’t you like? What can be done better? Use the insights to better align your organization to achieve greater results when the next opportunity presents itself. February 2017 – Begin discussing staff allocation & assignment for spring sport championships with NCAA Softball Regional, NCAA Track East Regional, KHSAA Tennis, KHSAA Track & NCAA Baseball Regional, all within two weeks of one another.